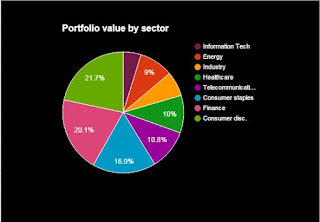 Looking at my current holdings, we see a reasonable balanced breakdown of sectors I'm invested in. Those who are familiar with the sectors used in David Fish' CCC list, might miss 2 sectors. You are right! I am not yet invested in any company related to the Materials or Utilities sector. Keeping my portfolio diversified is one of my main goals. This is why I was specifically looking for opportunities in these sectors. However, I did not find many great looking quality stocks here. During my research I came across ALB, SYT and CMP as potential purchases, but they didn't make the cut for different reasons. If theres anyone who might have a good suggestion, please let me know down below. The next best thing was adding a position to either Information Tech, Energy or Industry. This is where I found Caterpillar. Caterpillar is a huge company that manufactures mining and heavy industrial equipment. It is founded in 1930 and has grown to be the largest company in their business. Most of their segments, like mining, energy & transportation and resource industries are depended on natural resources. This is why their profits are not steadily growing, but making pretty big swings instead. In Q2 2015 they suffered a 13% decline in revenues, compared to Q2 2014, as indicated by the comparison below. The company has been raising their dividends for 22 consecutive years. Of course, this is just hypothetical, as people probably did not have the ability to for see the future, back in 1990. However, recent growth numbers are still double digits. The yield of 4.03% is well above the sector average of 2.06% (all industry contenders). With a payout ratio of almost 53%, the payout of future dividends should be maintainable. With a forward P/E of just 13.11, it sure looks like we get some value for money. This is an addition to my existing holding, because I had a little bit of money left in my account. KO goes ex dividend tomorrow. Hey DFS. Glad I've stumbled across your site. It looks good. Thanks for sharing this amazing journey with us. Nice buys! Quality companies are the way to go my friend. Keep it up and wish us the best! Cheers. Thanks for being here! It's an honour, as you are way ahead of me. I did relate to your story at your own blog, as I'm a poker player myself. Fortunately not with high stakes and I'm not addicted either. Nice purchases, DFS. KO is looking attractive at these level for sure. Tempted to buy this company that has perpetually been on my radar. I think CAT is the best bang for your buck if you are looking to add something in the Industry sector. However, there are lots of sectors out there that have very high quality businesses. Due to recent decline, many of them are available for a very fair price. Two solid names that have been in my portfolio from day one. CAT is sporting a very attractive yield these days after being crushed in recent weeks. Even though it's a cyclical business holding it for a long term horizon you should be quite happy with it. You're right. CAT was looking very attractive, but so are many others. It's hard to choose, but I am happy with my choice!